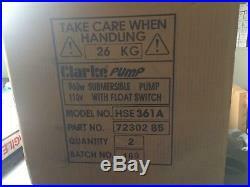 Suitable for pumping both clean and dirty water. Ideal for pools, fish pond circulation, rain water drainage, waterfall fountains, garden spraying, sump pits and waste water drainage. Features a robust cast iron base. Includes filter base, outlet connector and 2x 10m of heavy duty HO7RNF cable. Please note - pump inlet & out. Powerful 960 Watts, 110V motor. Maximum head (lift height) 12m. Can pump small solids in suspension. 10m of heavy duty HO7RNF cable. Lightweight construction at just 2.5 Kgs. High performace for the home or tradesman. 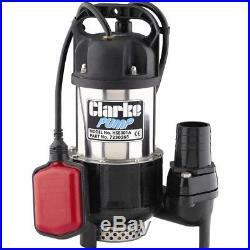 The item "Clarke HSE361A 50mm Submersible Water Pump (110V)" is in sale since Monday, July 30, 2018. This item is in the category "Garden & Patio\Ponds & Water Features\Pond & Fountain Pumps". The seller is "ammaahma10" and is located in Ilford. This item can be shipped to United Kingdom.